South Africa, as you have never travelled it before. Enjoy the splendour of one of the finest cities on Earth, Cape Town complete with penguins, fine wine and food and one incredible backdrop in the form of Table Mountain. Cape Town really does have it all. Departure from Cape Town to Pretoria on The Blue Train, one of the world’s most luxurious trains. In Fact, The Blue Train is not just a fabulous train journey, it is a delightful gastronomic journey as well. After overnighting in Pretoria you will head to Madikwe where the game drives should allow you to see African wildlife in all its glory. Fly to Cape Town and stay in style the Grand Daddy. Centrally located downtown, why not upgrade and enjoy the amazing views from their rooftop rooms? Cape Town has something for everyone. Whether you want to take in the history of Robben Island or the District 6 museum, explore the colourful houses of Bo-Kaap, relax and dine at the V&A Waterfront or soak in views from atop of Table Mountain, you have time to do it all. Day trips to Boulders Bay to see the Penguins or the wineries of Stellenbosch are also options available to you, adding that little extra something to your trip. 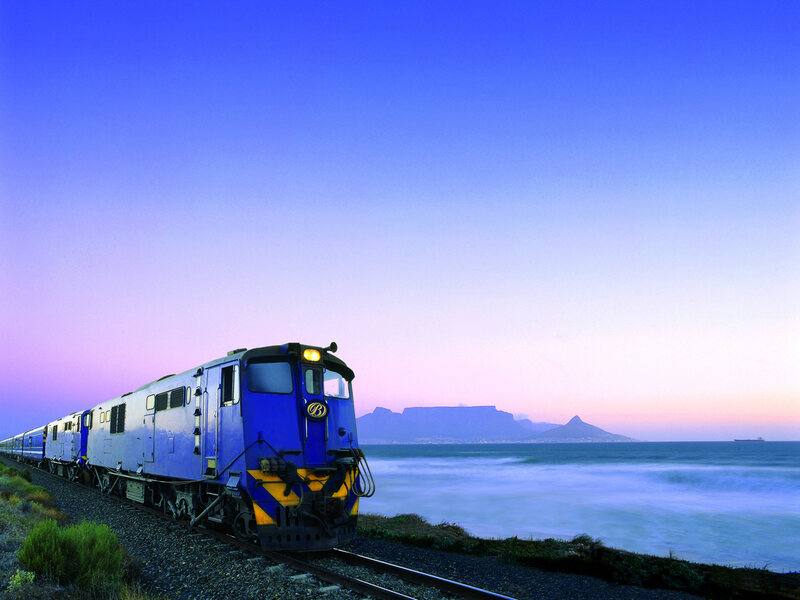 Relax and unwind as The Blue Train transports you in grandeur across 900 miles of stunning South African scenery. Since its launch in 1946, The Blue Train has offered a unique way of experiencing some of Southern Africa’s magnificent landscapes and landmarks. The train’s standard suites offer a choice between twin beds (with shower) or double beds (with ¾ bath). Each suite has a private entertainment centre with a choice of movie channels and radio stations, under-floor heating, a universal telephone system, an air-conditioning system, GPS, a Driver’s eye-view camera and free WI-FI. Guests can indulge in fine cuisine with personal Butlers at their beck-and-call, so take a journey into a timeless world of grace, elegance and romance, where spectacular scenery will stir your imagination and luxurious comfort will soothe your mind, body and soul. The Blue Train also includes an off-the-train excursion at Kimberley, the famous diamond mine and museum. After arriving refreshed at Pretoria station, you will collect your rental vehicle. Either head straight to your hotel to relax or explore the highlights of South Africa’s administrative capital, complete with grand university and public buildings and tree-lined streets. After a 3.5 hour drive towards the Botswanan border, you will arrive at the stunning Madikwe Game Reserve. This malaria-free park is rich in wildlife and a real hidden gem of South Africa. You will stay in a Luxury Bush Villa in a small and private resort. The villas boast large bedrooms, private decks with stunning views, en-suite bathrooms and private outside showers. Drive to Johannesburg Airport from Madikwe, return your rental car at the airport and take your return flight back to the UK. Why not watch Cape Town from the rooftop from your own converted Airstream room? Ride one of the world's most luxury trains, complete with your own private suite. Bed and breakfast from the comfort of this suburban Pretoria hotel. Relax and dine at the expansion V&A Waterfront. Complete with fur seals and a large aquarium, the waterfront is one of the most popular spots in town with tourists and locals alike. Explore the colourful streets of this distinctive downtown neighbourhood. Why not take a day trip to visit the penguin colony at Boulders Beach National Park? Hundreds of African Penguins and Hyraxes await you just a few hours from the city centre. En route to the penguins take in the views and colourful beach huts at Muizenberg Beach. Your carriage awaits. The Blue Train transports its passengers in style across 900 miles of stunning South African scenery. At the very rear of the train you can sit, relax, wine and dine, whilst enjoying the views you have just left behind. Drink a glass of wine, or read a book while The Blue Train travels across South Africa. Relax and enjoy the services of your own private butler. Shaken not stirred gin and tonic, single malt on the rocks... The choice is endless. Serving some of South Africa's finest cuisine, on a train. Dine in style. Step off the Blue Train and explore Kimberley Diamon Mine. Highlights include Big Hole, the largest hand-excavated hole in the world. Explore Pretoria, the administrative capital of South Africa and home to many leading museums. Safari in the stunning setting of Motswiri Private Safari Lodge. Safari in the stunning setting of Motswiri Private Safari Lodge, complete with pool, private decking and well-equipped rooms. This small, privately owned game reserve has some of the best game viewing in all of South Africa.